Biography: Cassandra is currently enrolled in college pursuing her Bachelor’s degree in Criminal Justice. 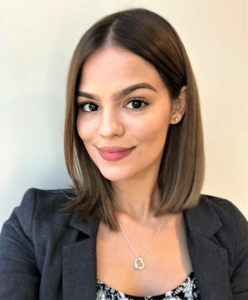 Prior to attending school, Cassandra worked alongside a retired Miami Dade County Circuit Criminal Judge as his Paralegal in which strengthened her passion for the law. Cassandra has also worked alongside former prosecutors and has experience in areas such as Criminal Defense, Civil Litigation, Entertainment Law, Personal Injury, Family Law and Construction Law. Cassandra has a desire to come to the aid of others and as such plans to enroll in law school to accomplish her goal. When not working, Cassandra likes to spend time with her dog and relax at the beach.